The Certified Professional in Training Management (CPTM™) program is the only credential focused specifically on the role of the training manager. As a CPTM, you will gain the skills needed to manage corporate training programs that align with your company’s goals – now and in the future. You will develop core competencies that will allow you to demonstrate your expertise in training management and impact change across the business. Download a copy of the CPTM training brochure to learn how this leading certification for training managers can help you get a seat at the decision-making table. WHO SHOULD BECOME A CPTM? This program is ideal for anyone who wants to further his or her career in training management. Because CPTMs come from diverse backgrounds, there are no prerequisites for earning the credential. Many CPTM candidates currently lead a training department or aspire to become a training manager, while others are external consultants who wish to better understand their clients’ roles. Each of these backgrounds brings special areas of expertise to the management of a training organization. To explore whether CPTM is a good fit for you, take this short quiz. The CPTM training program is $3,495, which includes access to the online prework modules, participation in the practicum of your choosing, and two attempts at the final exam. 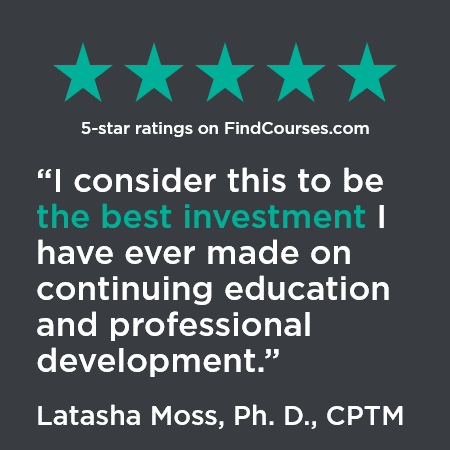 Become a CPTM and push your career in learning and development to the next level. View the process to learn how you can become a Certified Professional in Training Management in as little as two months.